Buy Hilton points at 0.5 US cents each for great value luxury hotel redemptions. Buying Hilton points can be a great way of scoring luxury hotel rooms for less. Hilton holds several points sales every year, and has just launched its first sale for 2019. From now till 27 February 1.59pm SGT, you can buy Hilton points with up to a 100% bonus. Hilton points normally cost 1 US cent each, so this promotion lets you buy them at 0.5 US cents per point, which is the lowest price we ever see available. 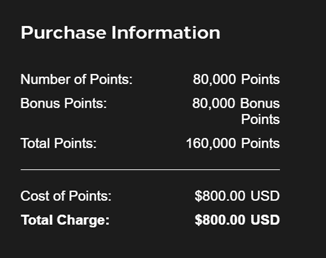 Technically speaking, each account can purchase a maximum of 80,000 points a year, pre-bonus. However, Hilton lets you combine points across accounts for free, so there’s nothing stopping you from creating a few more accounts and consolidating them, or pooling them with a friend or family member. The classic use case for buying Hilton points is to snag a stay at a luxurious property for much less. 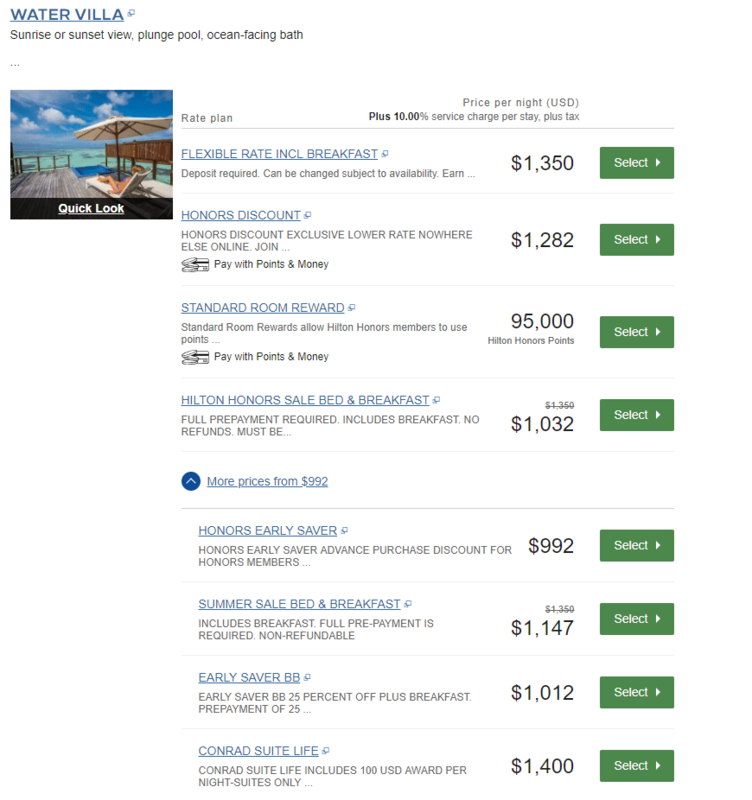 Take for instance the example of the Conrad Maldives (do have a read of Louis’ recent trip report), where an award night at goes for 95,000 Hilton Honors points a night. Paid rates can cost as much as US$992 a night before tax. If you purchase Hilton Honors points at a 100% bonus during this sale and use those points at the Conrad Maldives, you’ll effectively be paying only US$475 a night. Remember that if you’re a Silver member or above, you get the 5th night free on awards, reducing the overall cost to US$380 a night. Hilton Honors Silver status is offered to all AMEX KrisFlyer Ascend cardholders. What’s even better is that using Hilton Honors points to book your stay gives you a flexible reservation, compared to paying the lowest available rate which is usually a non-refundable rate. Even at city hotels such as the DoubleTree by Hilton Kuala Lumpur, purchasing Hilton Honors points for your stay might save you some money over paying the cash rate. A Hilton Honors reward night would set you back 10,000 Hilton Honors points per night, which would cost you US$50 if you purchased points in this sale. The cash rate at this hotel hovers around US$86 on the Honors Discount rate which has the same cancellation policy as the points redemption rate. Again, you’ll be coming out ahead if you purchase Hilton Honors points for your stay at the DoubleTree by Hilton Kuala Lumpur. Matthew reviewed this hotel in December 2017 and found it to be rather decent. If you were thinking of heading across the Causeway for a staycation, the DoubleTree by Hilton Johor Bahru now costs 20,000 Hilton Honors points a night, up from 10,000 a few months before. 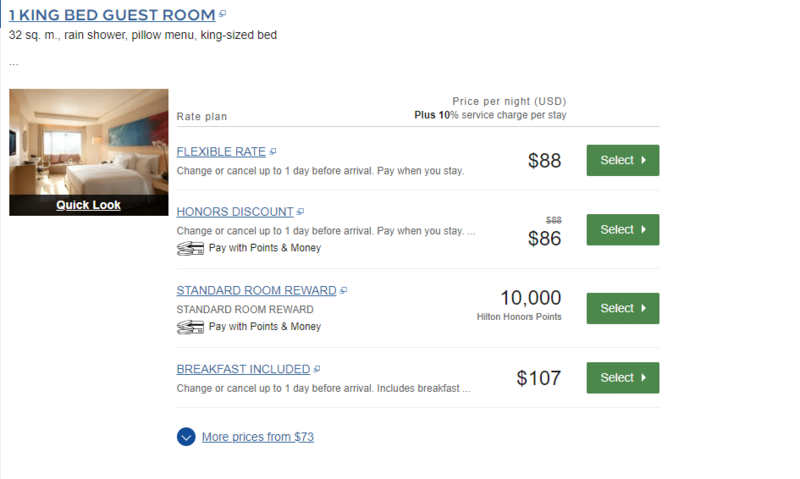 Hilton no longer publishes award charts, which means its free to change hotel costs at will. This is more a concern for the lower category hotels, because the upper end is still fixed at a maximum of 95,000 points a night. What card should I use to purchase Hilton points? Is it for all Hilton hotels? I recently joined as a silver honor (with AMEX ascend promotion). hi ken- yes and no. the max 95k points per night IS a given, so long as a base room is available. if you’re seeing rates in excess of 95k, it means the base room is not available anymore. Actually, certain properties don’t even have ‘base rooms’… not because they’re sold out (yes, there are cases of this too), but there a several properties that don’t have them, period. Only ‘premium rooms’ or higher.. Note that the Hilton is also running a sale for members and the discounted prices at times work out to be cheaper than using points (even with this points sale). Hi Josh.. One should also be aware that whilst bookings using points or cash+points are almost always cancellable as late as 12 hours before booking date, sale prices are almost always payment upfront and non-cancellable/ non-refundable.. so one needs weigh which category they fall into..
For the 5th night free, do I need to have points for all 5 nights in the account or 4 will suffice? 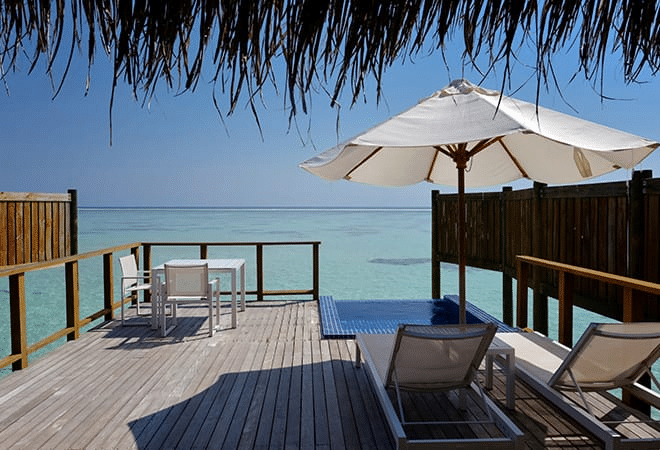 i am looking forward to book 5 nights WA at Maldives for Honeymoon but now still lack for 40k points, so sad – -!